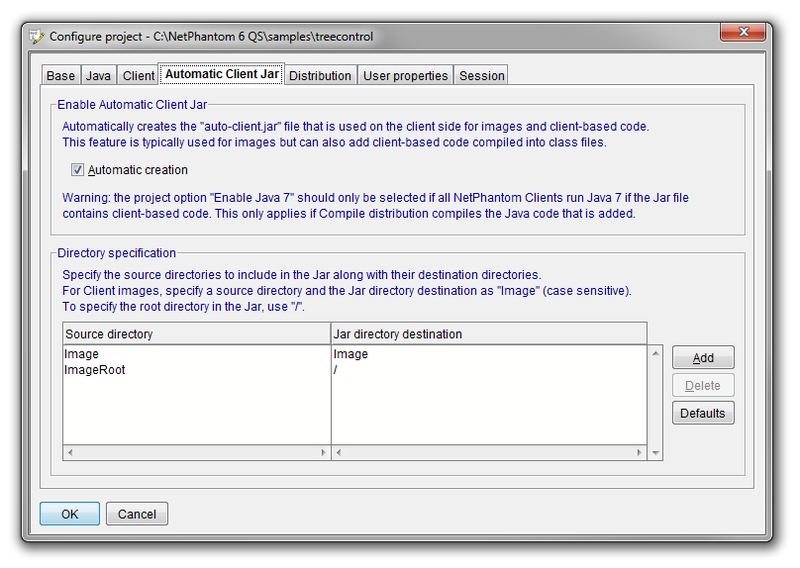 The Automatic Client Jar feature creates folders in the project that is used for the NetPhantom Client, typically images, but also Client-based code such as User Windows (the NetPhantom Swing and Java2D samples uses this feature). To add a resource to the Client Jar, just drops it in the defined folder, e.g Image. The NetPhantom Builder then creates the Client Jar automatically, and signs it (signing is an option that is enabled by default). This is done transparently in the background, and when the NetPhantom Client is started, this Jar file (called auto-client.jar) is ready and loaded on the Client side. Define the Directory specification as one or more directories in the project that should be placed in the Jar file, along with the destination directory inside the Jar. To place files in the root of the Jar, specify a forward slash '/'.